Steel wire rope is traditionally used for heavier mechanical hoisting operations. This type of rope is made of strands of wire wrapped together. The number of strands, the number of wires per strand, and the nature of the rope’s core all vary depending on the intended application of each particular rope. Steel wire rope is valued for its durability and abrasion resistance, though these qualities also render it heavy and awkward to handle. The wires in steel rope are prone to rust, and rough burrs on its surface can develop with use. As a result, steel wire ropes require regular inspections in order to identify broken wires, corrosion, metal fatigue, and other possible conditions and wear-and-tear. Steel wire rope can also store a great deal of kinetic energy, which will cause severe whiplash if it should break under load. The high mass of the rope and unpredictability of its breaking pattern create a clear safety hazard to users. Fiber rope is more pliant, lightweight, and generally easier to handle than steel wire. You’ve also got plenty of options to consider with fiber rope, as anything from the fibers themselves to the materials used to manufacture them can be manipulated to create the best rope for a given application. Overloading a rope can cause breakage, however, especially if it is internally compromised. The outer appearance of the rope is not a proper indication of its internal condition either, so it needs to be thoroughly and regularly inspected to prolong strength and longevity. Traditionally, fiber ropes are more prone to abrasion than steel wire rope and are susceptible to damage from ultraviolet light, various chemicals, and high temperatures; however, today’s manufacturers combat these issues by combining high strength core materials with protective outer covers. Science plays a significant role in how fibers are created for rope construction. For instance, in their product Dyneema®, the Dutch chemical corporation DSM changes polyethylene at the molecular level to turn the fibers to face one direction to increase breaking loads and reduce stretch. Studies have shown that some fiber ropes have a greater breaking strength than steel wire rope when comparing to the same rope diameter. Fiber ropes also do not store as much kinetic energy as steel ropes do, allowing for much safer handling in the event of a failure. These qualities are especially advantageous for marine applications. Each of these types of rope has its advocates who will argue its merits in any application. While it may have once been true that steel wire rope provided the sturdier and more reliable option for industrial hoisting applications, innovative rope construction techniques have transformed the product into a stronger and more reliable option for most industrial applications. Ropes like the Ocean 3000 and the Ocean 5000 provide a safe alternative to the steel wire rope. These ropes come equipped with Robline’s upgraded SL coating to ensure good ultraviolet stability and enhanced abrasion resistance. This outer covering can be a tremendous tool to utilize, as it will protect the Dyneema core from abrasion or an excess build-up of heat, depending on the application. 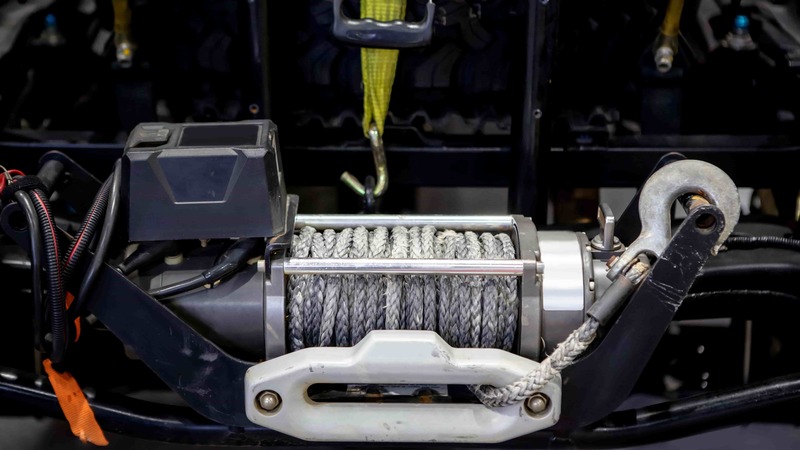 While considering a fire rope option can have its benefits, it’s ultimately still vital to partner with that is well-versed and familiar with the rope options available, as they will be able to provide you with the best solution to the fiber as well as the right attachment and turning points you’ll need. This way you can guarantee that the fiber ropes you use, such as the Ocean 3000 and 5000, will have a long and durable lifecycle.